Poland has only 12 international airports connecting all regions of the country to the rest of the world. See the list below to find the most convenient one for your route. 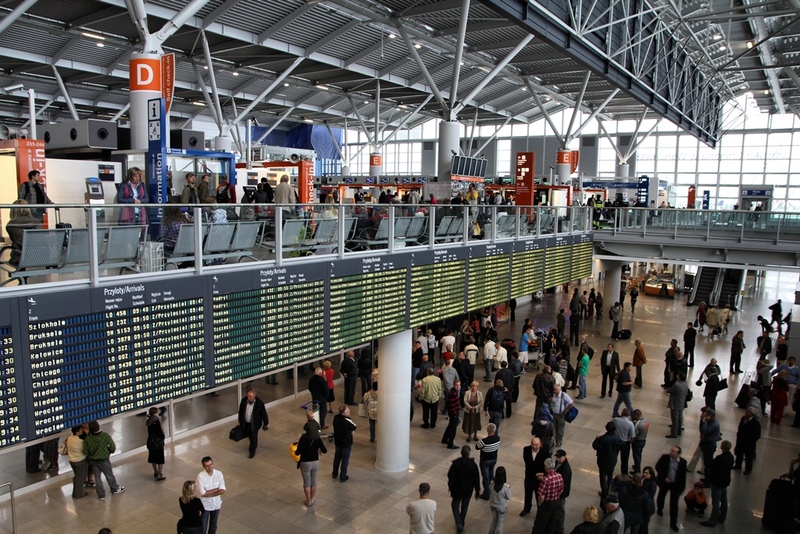 Warsaw Frederic Chopin Airport is the country’s both largest and busiest airport, handling more than 40% of the country’s total passenger traffic. It handles approximately 40-50% of Poland’s air passenger traffic. The busiest international flights from the airport are to Frankfurt, Amsterdam, London, Chicago and Paris. There is only one passenger terminal, known as Terminal A. The best way to reach Warsaw city centre is by rail as connects the airport to the city centre in 20 minutes. Another possibility is taking a bus which connects to Warsaw city centre with lines 175, 188 and N32 (during night). There is an additional line 148 that goes to Ursynów (south of Warsaw) and Praga (an eastern part of Warsaw). Warsaw is a perfect place to visit other international destinations like Vienna, Berlin or, as already mentioned, Prague. Wrocław Nicolas Copernicus Airport is an international airport serving the city of Wrocław in the South West of Poland. The airport is situated 10km south-west of the city centre. It has two passenger terminals and one cargo terminal. Due to its vicinity to the city, it is not a problem to reach it, by bus or by car. Bus line 106 goes daily to/from the Central Railway/Bus Station every 20 minutes. The entire journey takes approximately 40 minutes, depending on the traffic and wheather conditions. Night bus line 206, operates on the same route through the Airport. From Wroclaw you can visit other places, e.g. Krakow or Katowice. Saint John Paul II Airport Krakow–Balice is an international airport in the village of Balice, near Krakow, 11km of the city centre in southern party of the country. Shuttle buses link the Balice Airport with the Krakow Glowny central station, located close to the Old Town historic district in the middle of the city. They run every 30 minutes and the journey takes less than 20 minutes. The earliest train to the Krakow Airport leaves from the central station at 4:05 am and the latest one at 11:35 pm. The first and the last departure from the airport station are 5:16 am and 0:15 am respectively. Gdansk Airport also known as Lech Wałęsa Airport is an international Polish airport located 12km west of the city of Gdansk. The airport is named after former Polish president. It is relatively simple to reach the city from the airport. Bus line 210 of ZTM Gdansk takes 40 minutes to get from Gdansk Airport to the main railway station of Gdansk (Dworzec Glówny). Katowice Airport is the country’s fourth busiest airport. It is situated 30km north of Katowice, in Pyrzowice. There are 3 bus lines connecting the airport to different areas in town: Bytom – Airport – lines 85 & 53, Mierzęcice – Airport – line 17, or a direct bus shuttle. From the city you can visit other places nearby such as Krakow. Warsaw Modlin Airport is an international airport opened in 2012 after being used as a military airfield. It is located 40km of Warsaw’s city centre. The airport is intended to be used by low-cost airlines and it serves as a base for Ryanair. See here how to get to Warsaw from Warsaw Modlin Airport. Poznań–Ławica or Henryk Wieniawski Airport is one of the country’s oldest airports, locates 5km of the city centre. During season it features flights to many destinations like Hurghada and European resort destinations. Rzeszów–Jasionka Airport is an international airport in southeastern Poland, in a village of Jasonka, 10km away from the Rzeszów city. It is the seventh busiest airport in the country in terms of passenger traffic. Solidarity or Szczecin–Goleniów Airport is the main domestic and international airport for the region around the city of Szczecin. It is located 45km north-east of the city centre, in the village of Glewice. Lublin Airport is an international airport serving the city of Lublin and the surrounding region. It is located 10km east of Lublin. Bydgoszcz Ignacy Jan Paderewski Airport is an international airport serving the area of Bydgoszcz city. It’s the country’s ninth busiest airport by the number of passengers. Łódź Airport also known as Władysław Reymont Airport is an international airport in central Poland, located 6km of the city centre. It features flights to several European destinations.